Oprah Winfrey said Wednesday that she is not running for public office, seemingly putting to bed rampant speculation that she was considering a 2020 White House bid. In a conversation with Hamilton star Lin-Manuel Miranda at the Apollo Theater in Harlem, the subject of Donald Trump's election came up, according to the Daily Beast. Miranda, an opponent of the Trump administration, said he was aware of the platform afforded him by Hamilton‘s success. "But that’s it," he said. "I’m not running for public office. According to the report, Winfrey interrupted to say, "I'm not either!" Oprah is a more powerful position than president," Miranda said jokingly, after the crowd's roar at Winfrey's comments died down. 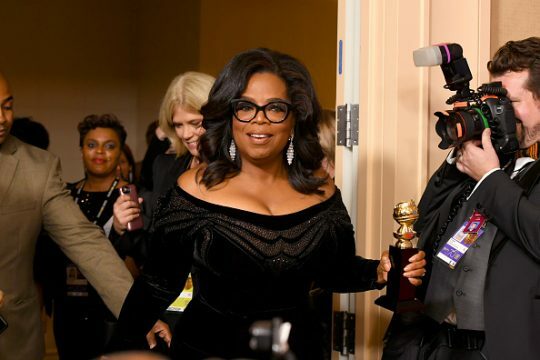 Winfrey's well-received speech at the Golden Globes when she received the Cecil B. DeMille Award last month sparked a media frenzy about whether she would take on Trump in 2020. CNN's Van Jones declared Winfrey to be the "queen of the universe" who would "destroy anyone in front of her" if she ran. CNN media reporter Brian Stelter called Winfrey's speech, which touched on the #MeToo movement against sexual harassment, "downright presidential." Stoking the speculation was her best friend, CBS host Gayle King, who said she thought Winfrey was "intrigued" at the idea of running for president. Like the current president before he took office, Winfrey is a billionaire media mogul with no prior military or political experience. This entry was posted in Politics and tagged 2020 Election, CNN, Oprah Winfrey, Van Jones. Bookmark the permalink.